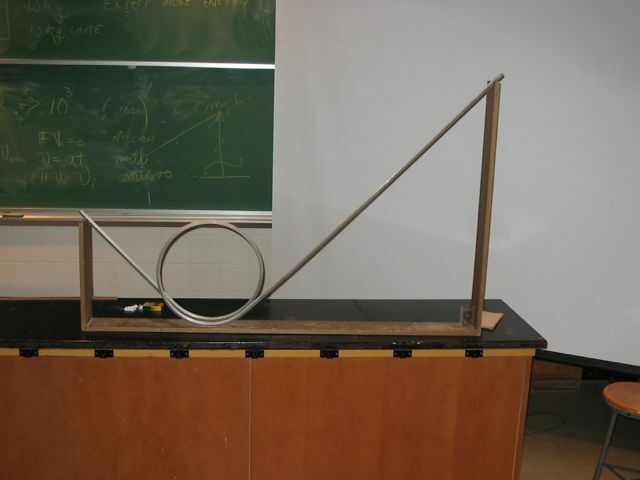 Description: Gliders of equal, or different, mass can be used for various momentum demonstrations. The gliders have springs for elastic collisions and there is putty available to adapt them for totally inelastic collisions. Track is powered by the blue vacuum shown in the picture. 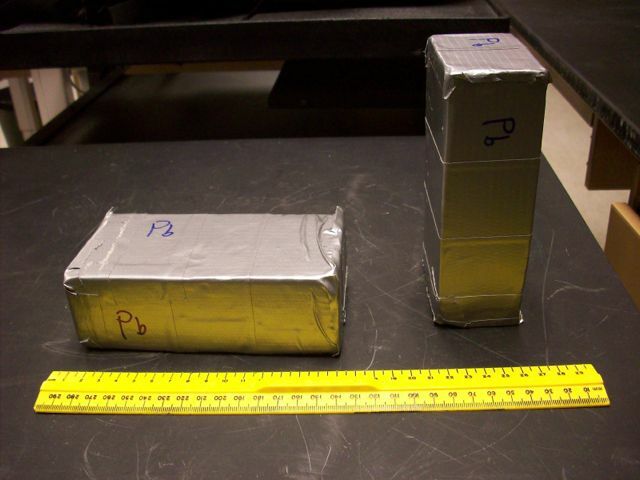 Description: Carts of equal, or different, mass can be used for various momentum demonstrations. The carts have springs for elastic collisions and there is putty available to adapt them for totally inelastic collisions. Weights may be placed on top of the carts to increase their mass. 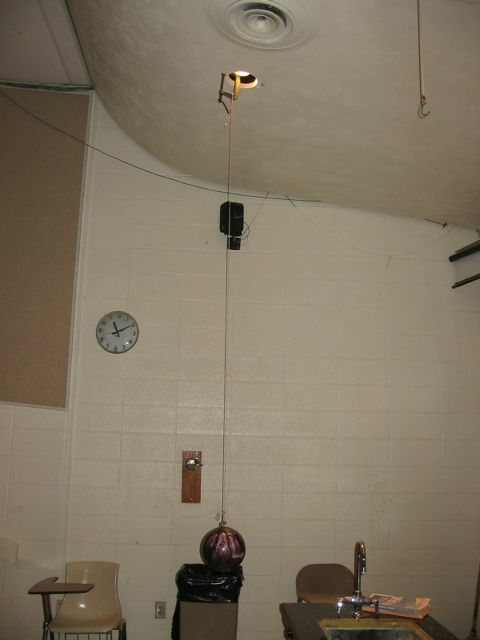 Description: Demonstration of the interplay between kinetic and gravitational potential energy. Golf balls are rolled down the track's channel. 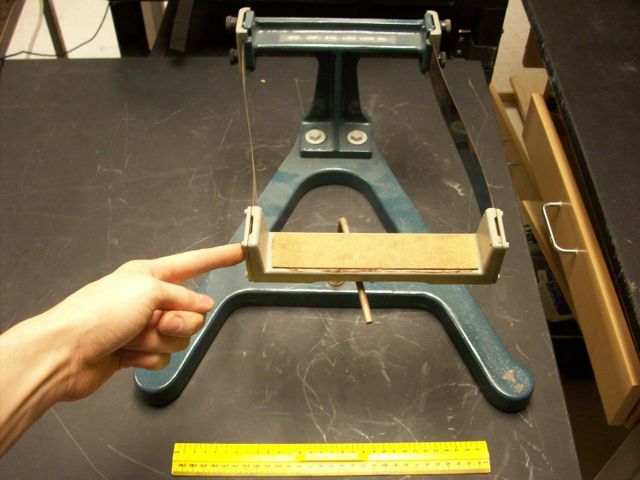 Description: Center of mass demonstration. 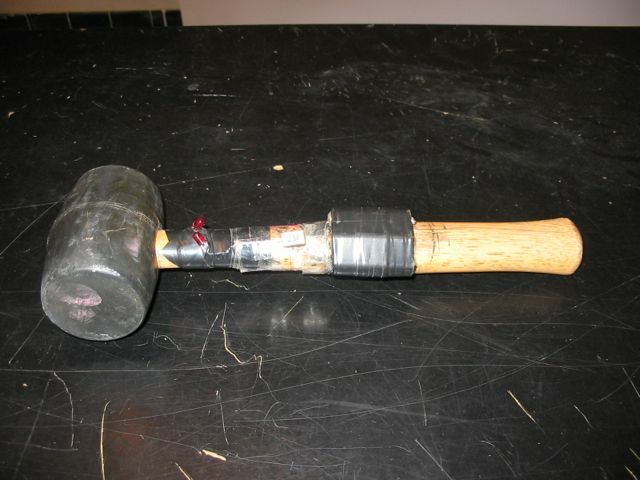 LED is mounted at the center of mass of the hammer. When the hammer is thrown, the led traces out a 'smooth' ballistic trajectory. 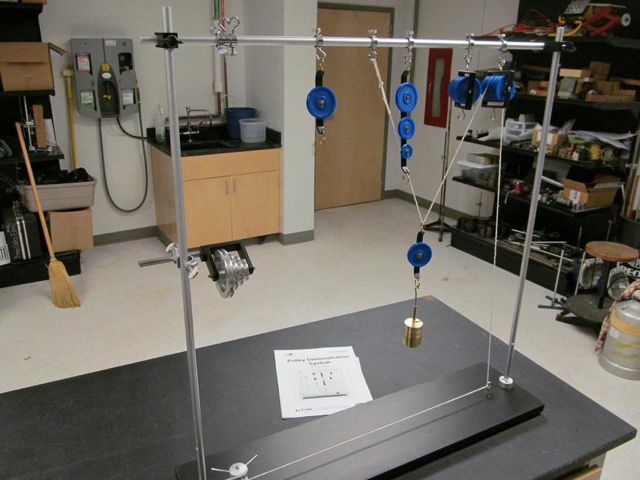 Description: Show various combinations of pulleys and mechanical advantage. Description: Two balls are released at the same time (released pin strikes one and moves out from inside the other). One ball drops straight down. The other ball is projected horizontally. Both balls hit the floor at the same time. 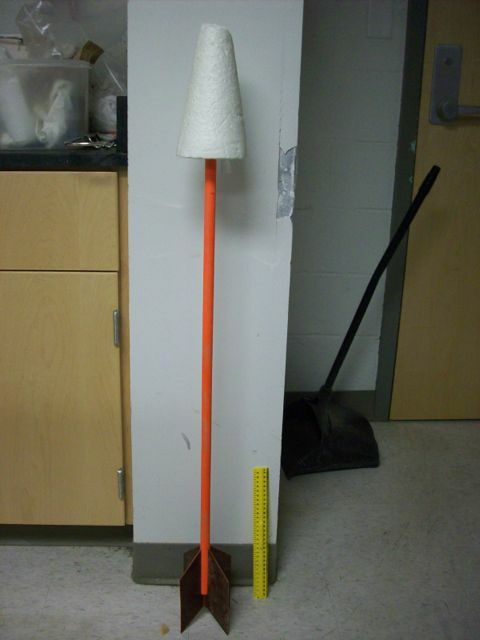 Description: A plastic ball is projected by the device in the left photo at the target in the right photo. The target is held by a magnet and drops at the same time the ball leaves the 'gun'. Careful alignment is required. 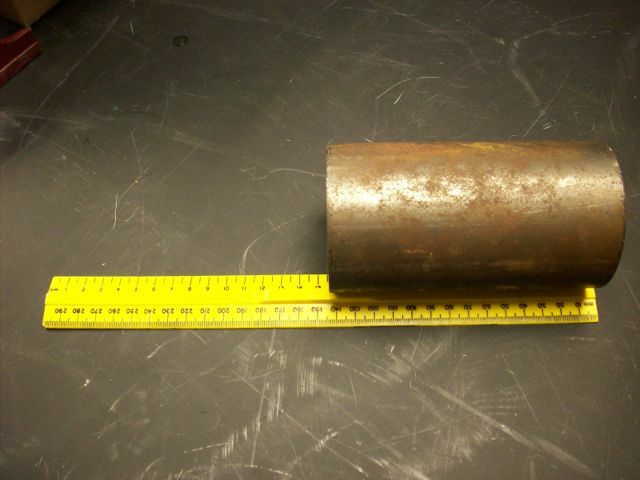 Description: A penny and feather are located inside of a long (somewhat heavy) glass tube. The air is pumped out of the tube with the vacuum pump on a cart (not shown). 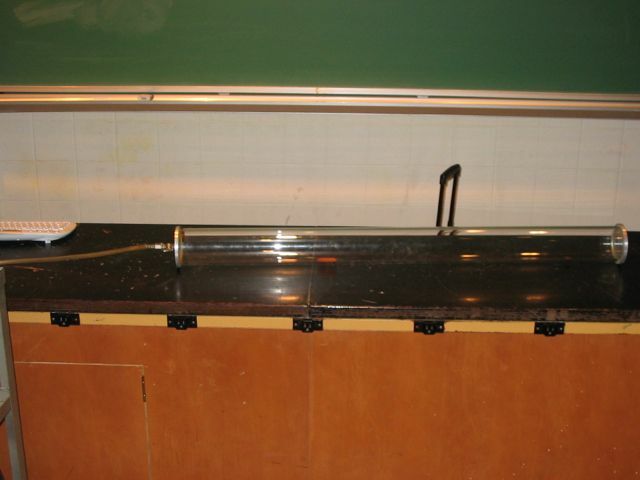 The two object fall at the same rate when there is no air in the tube. It is best to pump the tube down first and then open the value to demonstrate the effect when air is present. 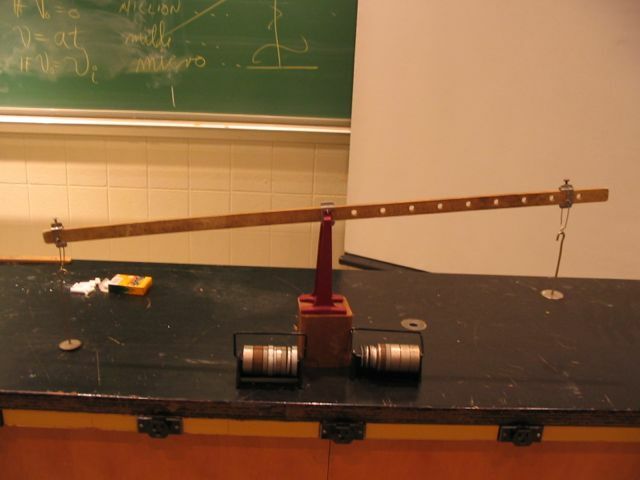 Description: Simple demonstration of torque using a meter stick and weights. 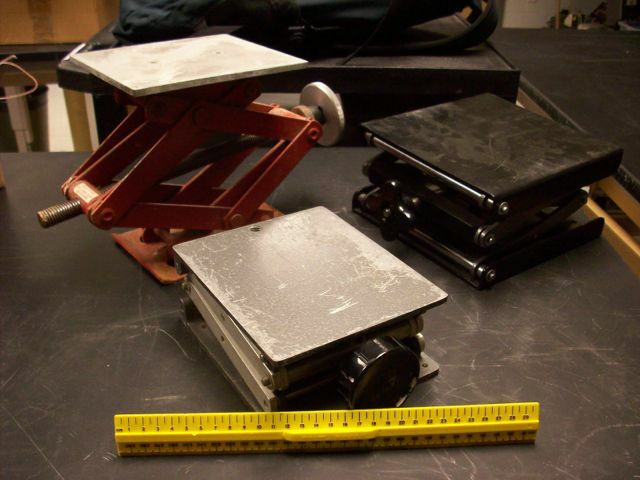 Description: Turntable seat for angular momentum conservation demo. Various weight blocks are available to be hand-held (pull arms in when spinning to increase angular speed, etc). 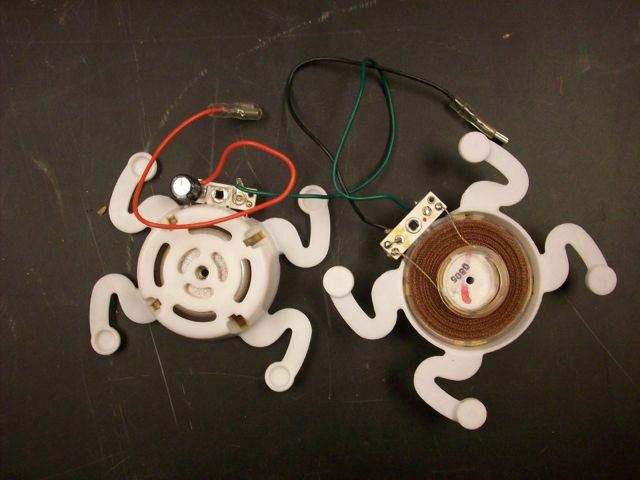 Description: Wheels for angular momentum conservation demo. 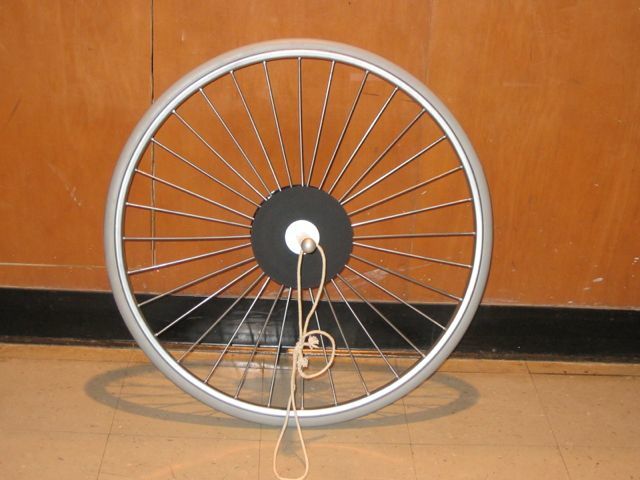 The briefcase wheel can be spun up, then closed and handed to a student to demonstrate the gyro's resistance to change in direction. Description: Demonstration of Newton's 3rd law. Requires modified CO2 fire extinguisher. 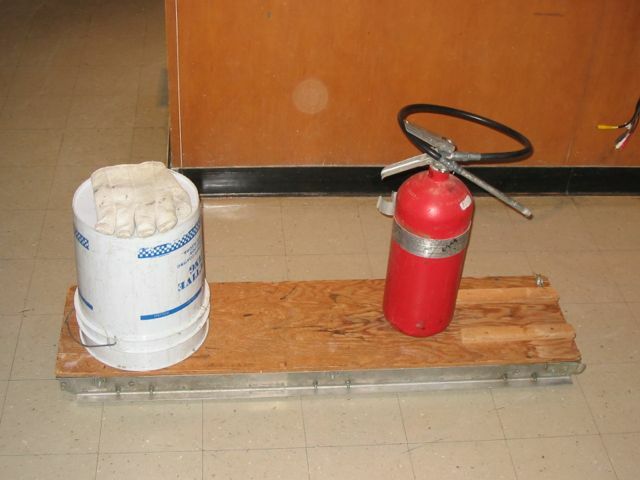 (The fire extinguisher are filled by the W&M fire department. If no extinguishers are full, this can take a couple of days.) Use care when doing this demonstration. Wheels of the sled are only suitable for smooth floors. 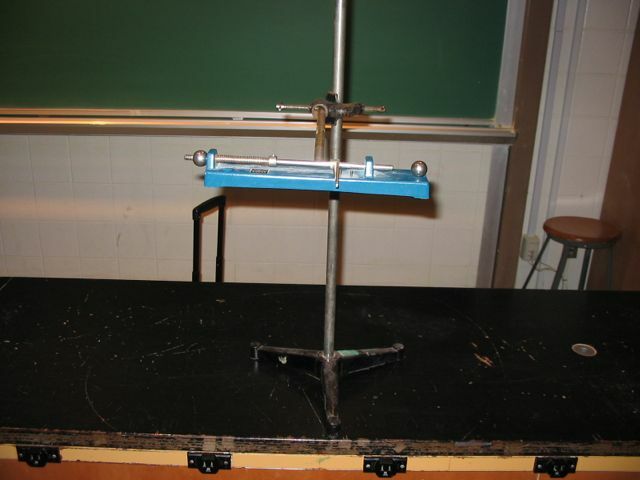 Description: Demonstration for conservation of angular momentum. 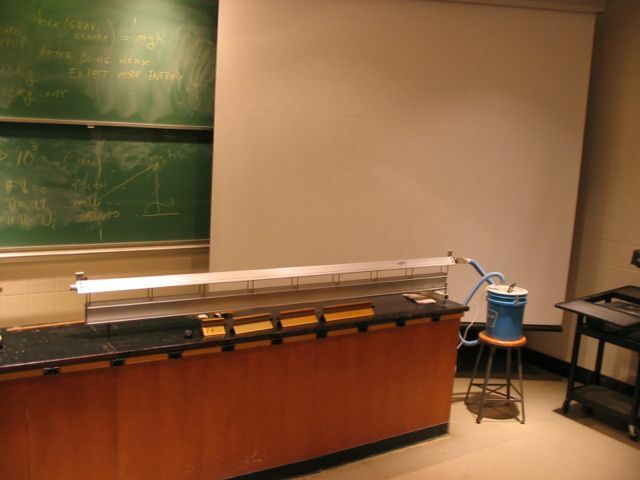 Description: Can be mounted in either Small 111 (big lecture room). Small 110 (smaller lecture room) has a pedulum that is accesable from the HVAC room above the lectuer hall (via the demo. room back door). Note:Pendulum in picure is not in the renovated Small Hall. Description: Glass one lights up on impact. Description: Wire or string attachment. Description: Put small CO2 cartridges in the handle (unscrews), and the puck floats on the gas coming out of a small hole on the bottom. Usefull for "frictionless" motion demonstrations. 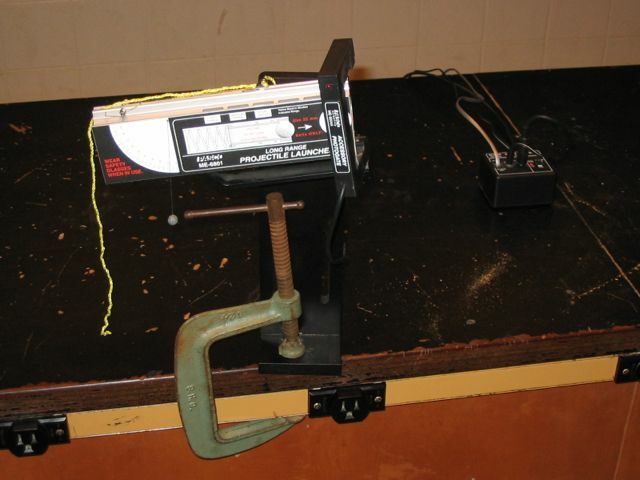 Description: Used to show a physical "vector" with magnitude and direction. Can be used to explain the symbols for a vector coming into, and out of, the board. Description: Blow up baloon to show that it won't pop because the pressure is distributed over a large area, versus a single nail which will pop it. Description: Oscillator using two thin bands of metal. Place masses on the top, displace it to the side, and it oscillates horizontally. Period of oscillations depends on intertial mass, not gravitational mass. Description: Dropping the stack of balls on its end shoots the small top red ball higher thatn it would bounce on its own if dropped from the same height. Description: The balls look and feel identical, but one is made of rubber with significant space between the molecules allowing it to compress, while the other has little or no space between the molecules of rubber, allowing little or no compression at all. Description: The cart will role when the fan is turned on. 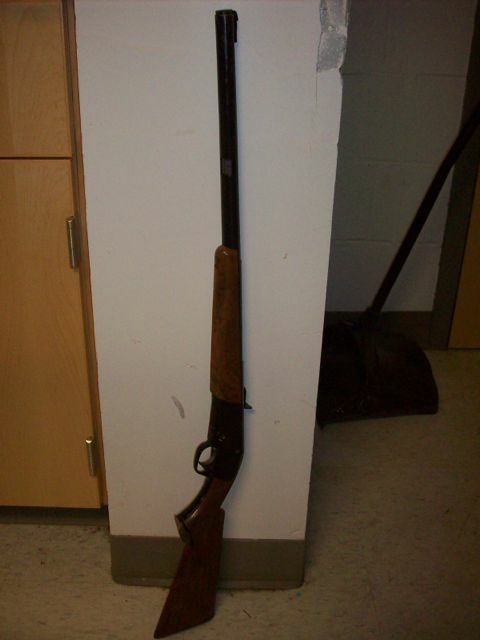 If the plastic shield is attached, the motion will cease. Description: Lay the platic spacer on top of the pedestal. Then, place the ball on the spacer, pull back metal the tab and release. 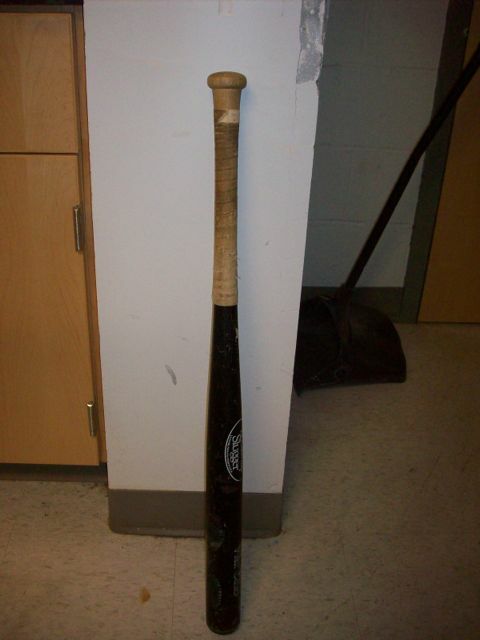 The plastic spaer should have been knocked from under the ball, and the ball should be resting on the top of the pedestal. Description: Marbles released from same height at same time will reach the end of the track at different times. Energy is conserved. Description: Inflate inner balloon and insert cork. Remove mouth and the balloon will remain inflated. Demonstrates fluid pressure and presure reduction. Description: Pump the balls down with a vacuum pump to demonstrate that the strength of the pressure pushing on the outside from atmosphere is greater than that of the pressure on the inside. 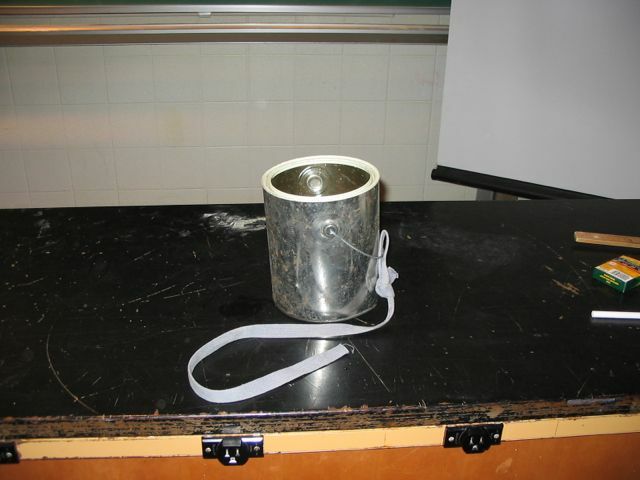 Handles allow students to pull on it, or to attach weights. 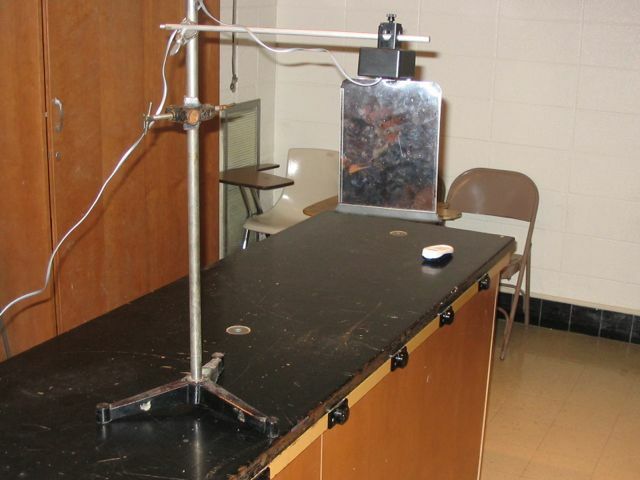 Description: Masses on Springs to demonstrate simple harmonic motion. Description: Various masses are avaliable. Spheres, hanging masses, stackable plates, and large ( >1kg) masses. Description: Approx. 10 foot long steel springs. 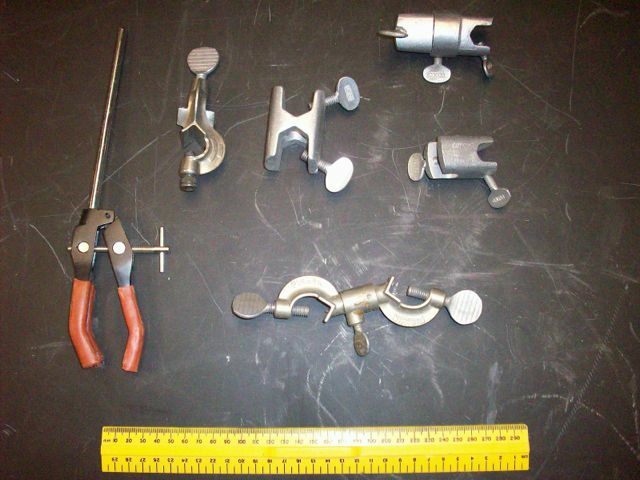 Description: Various clamps and brackets for holding things. 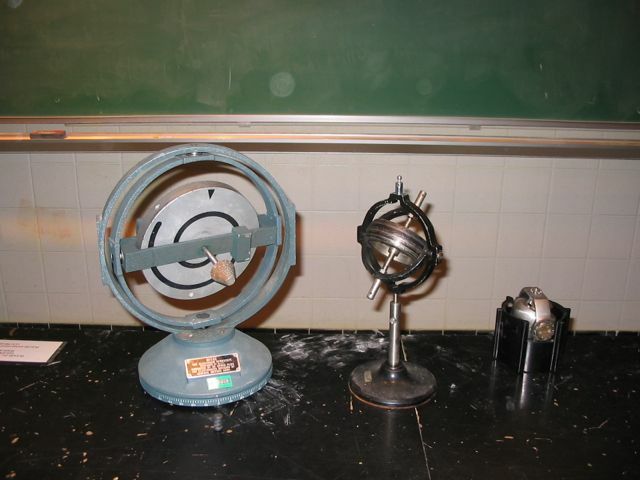 Used with the various rods and rod stands in the demo room. 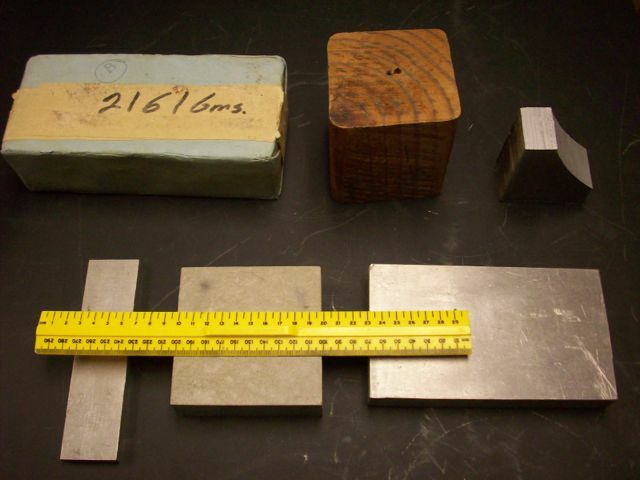 Description: Blocks of various sizes and materials (wood, Aluminum). 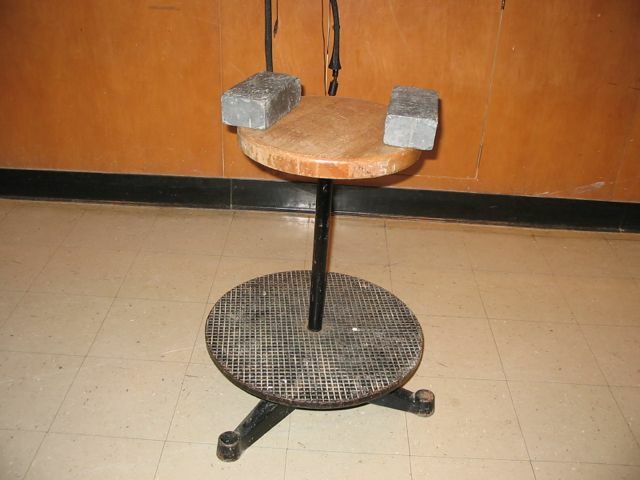 Used for weights, stands, etc. 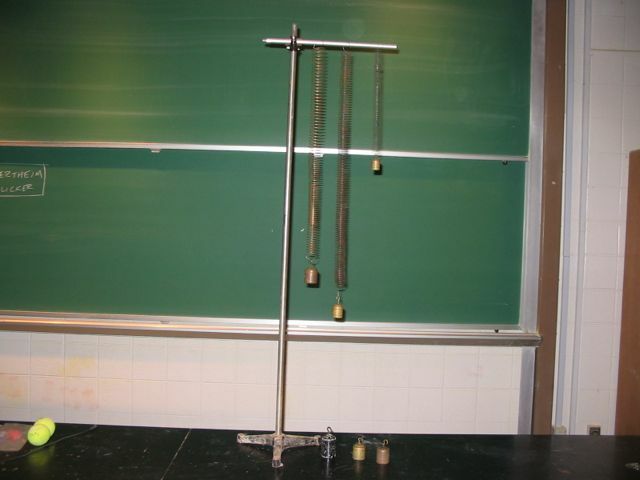 Description: Large clock-type pendulum on a rod, whos length may be varied. 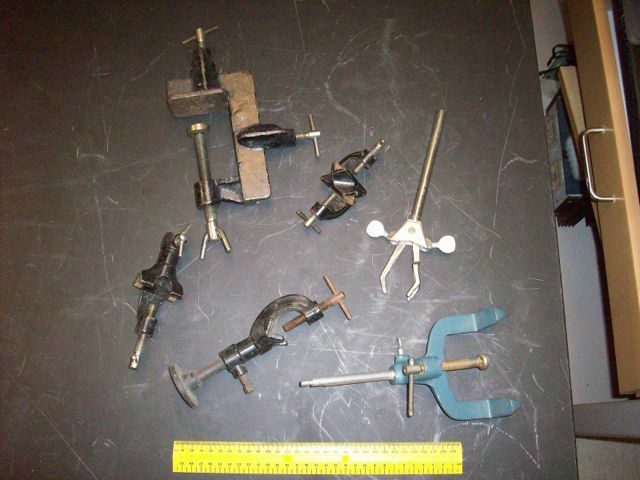 Description: Various pulley, some with clamps attached to mount them, some attached to rods which can them be mounted. Description: Useful for rolling down an incline for moment of inertia destrations. 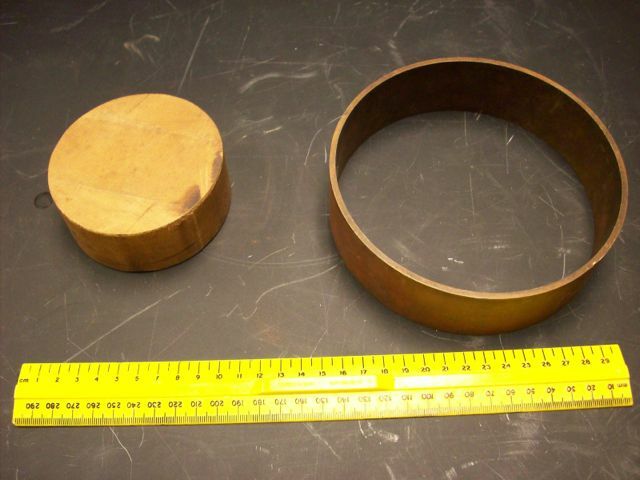 Description: One large industrial suction cup and two small.